In recent days, the Justice Department (the moniker of an animal rights terrorist group) sent a letter to my home that contained razor blades and graphic threats to “cut my throat”, and they have openly announced that they sent similar letters to at least one of my trainees. The letter that was sent to my home, which amounted to an amateurish attempt at instilling fear, is the latest in a series of psychological attacks by animal rights activists who have focused their attention on UCLA researchers. The threat to send such a letter to my graduate student is pathetic, desperate and horribly misguided. Putting aside the miserable cruelty required to construct and send these missives, the letters lack the gravitas required to react to them with fear. They make claims that are almost laughable. The letter to me claimed that the writer knew “…where I got my dry cleaning done,” but I haven’t been to a dry cleaner in more than 5 years. It’s hard to take a threat seriously when it is based upon such daft statements. 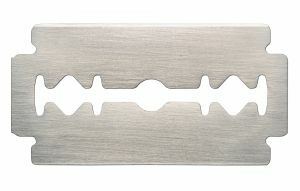 As for the razor blades that have been dipped in “AIDS blood”, it is impossible to react fearfully to any threat that is both factually wrong (it was obvious to me that the razor blades sent to me had no blood on them) and scientifically ridiculous (the HIV virus cannot survive in dried blood on a razor blade sent in the mail, even if the blood was there to begin with). Here is my message to the Justice Department and to any others that think it is acceptable to use intimidation tactics to stop researchers: you will not succeed. Responsible use of animals in research aimed at improving the health and welfare of the mentally ill is the right thing to do, and we will continue because we have a moral responsibility to society to use our skills for the betterment of the world. Every day that my students and I work in my lab, we are contributing to the progress of humanity. You, on the other hand, take civilized society backwards with your zealous determination to punish any and all that do not share your philosophy on human-animal relationships. Even if you choose to continue acting like childish bullies (toothless though you often are), I will not give up my hard work in the laboratory on behalf of those who need my help. I will not feel fear in response to your increasingly desperate and puerile attempts to frighten. In the end, you will fail. Posted on November 19, 2010 by EditorPosted in Animal Rights News, Campus ActivismTagged aids, animal research, animal rights activists, animal rights extremists, hiv, Justice Department, razor, razor blades. A fantastic reply. It made me happy to read your sober though gleeful denial of their attempt to scare you. Fundamentalists whether of “The Book” or of their own book constitute a direct threat to society and the billions of lives that will end if modern society and it’s technology falls to Ludditism. On a side note, my experience meeting animal activist sorts in college suggest that it is not the nature of your techniques but their content that is threatening to what are frequently a bunch of untreated ADHD kids self medicating with EtOH, stimulants and THC. The irony is overshadowed by a response akin to the violent response of some to an Intervention. Your work highlights the dysfunction they have grown dependent upon. If you skinned kittens to make Pot grow Xtasy crystals, you’d be waking up to home improvements. Except these pathetic scarorists are, at heart, too lazy to build, only have enough energy to destroy the work of others, not unlike another group of fundamentalist zealot students (taliban) famous for destroying culture. Keep up the good work Dr. Jentsch. Your courage is an inspiration and a required line fighting the barbarism that develops within the civilization. “injunction”? Is that a joke? or are you a convicted harasser? Appeasement doesn’t work for tyrants large nor small. Bravo to Dr. Jentsch for standing up for human society. Thank you for your stance and your courage. Only through such strength can we keep these terrorists from foisting their extremist religious views on us all. I don’t want to violate my injunction by leaving a comment here for anyone other than you…. so maybe you could ask Beinus to fact check this post also. Too late. The FBI already has a copy. For love of God would you please spell my name right! It’s posted on your damn web site! You’d think you could at least read your own crap! Dr. Jentsch has it exactly right: Either he and his colleagues continue their work, or all of mankind begins a slow slide back to the Middle Ages, when appendicitis, a minor hand laceration or childbirth often meant death, and by age 35. Every veterinarian, indeed every citizen, must speak out against animal rights extremism wherever and whenever it is found. People matter too. Ha ha. False dichotomy, much? When the people who are presenting themselves as scientists can’t abide by the basic rules of logic, we’re screwed. Be nice if the ignorant on both sides just kept quiet. Trying to sound educated and smart is not the same as being smart. Perhaps you could fact check the info in this blog post…just to make sure it’s up to super secret squirrel level? Really? That’s the best you can do? Something from a year ago? Pathetically sad really. If you don’t know the context of Secret Squirrel, please stay out of the conversation. Thank you for all you hard work; we know for sure the high standards and excellent care you have every day with your research. Thank you for standing up against these terrorists and for continuing your efforts in the laboratory .I’m sorry that you and the people in your lab have to experience these threats, but I’m proud of you for the strength to stand up against them for the greater good of humanity. I know where your sister’s, cousin’s, nephew’s best friend’s girlfriend’s father-in-law buys his cigars. Apparently their intelligence network is on the level of super-secret squirrel level because they know where you had your dry cleaning done 5 years ago. Perhaps you could tell them to pick up that quilt you accidentally left there five years ago while their milling around waiting for you. Thank you for all you do stand up against these terrorists and for continuing your efforts in the laboratory. It is so sad that you and your trainees have to endure these threats, but I admire your strength to stand up against them for the greater good of humanity. What a bunch of self-righteous, lunatic punks. Dr. Jentsch and his students are showing us, yet again, that society should not bow to terrorism. Not from Al-Qaeda, not from anti-abortion extremists and certainly not from animal right extremists that want to stop the advance of medical science that will benefit all of us. We stand with you and your students! I see… and what does it mean when people call those they disagree with “monsters”, “psychopaths” and “murderers”? Can you please tell me? clearly much depends on whether the people being addressed actually are monsters, psychopaths, or murderers…context matters. Diana… You are right on one issue… Context does matter… For example, people do get upset when being called animal killer … by rabid, screaming animal rights protesters who talk about violence towards researchers during targeted home pickets. Or when that statement is embedded in ignorant and blatantly fallacious claims about the value or nature of their scientific work. Again, yes, context matters. Context aside, there are a significant number of animal rights activists that are self-righteous, that are convinced that they, and they alone, have some unique and pure vision of what is right and what is wrong and that believe that they have an obligation to purge the world of all non-believers. Sound familiar, at all? Clearly much depends on whether the people being addressed actually are self-righteous and fanatics …context matters. Absolutely appalling. These few lunatics are doing more to undermine the serious attempts to reform unjustifiable “uses” of animals in science than this website and the rest of biomedical-industrial industry put together. The sooner they are locked up the better. Peace for all creatures.